There are 7 reviews of Levantium. This is a really generic, woody, traditionally-marketed-to-men scent. I used up the sample, but would not even consider purchasing a decant or bottle. Very boring. I was hoping to like this one, but it reminds me of Baruti's Berlin Im Winter and has that same sour edge that I just cannot stand. I've only worn it once, so I'll give it another chance before dismissing it completely, but on first wearing, it's just not my thing. Levantium has what you'd expect from a modern upscale oud perfume: lots of saffron mixing with patchouli and rose, a barely perceptible pinch of rubber, probably no oud, and a woody drydown. What it does differently from the crowd is actually a difficult-to-describe designer sheen. It has that non-specific chemical woodiness that you smell in a lot of men's designer scents, as well as a weird chemical cloak, a sort of metallic outer space lavender that knocks out my nose, leaving all the usual oud notes suspended in a haze of chemistry. I'm familiar with this effect from the original Polo, so I always associate it with mall scents. All that being said, this adds up to me not particularly liking Levantium. With the chemical theatrics, it smells like it's attempting to be common. If it didn't have them, it would have smelled like a hundred other upscale department store ouds. So, I guess that if you're a big designer fan who hasn't liked ouds before, Levantium may be the one to finally win you over. But if you're an actual oud fan, this may be a hard sell. This is an excellent scent. I like it very much. First -- to get some matters out of the way.... One need not fear the spices, floral notes (especially ylang-ylang), peach or vanilla. Sometimes, indeed often, I find these to be overdone for my taste. Not here. They are minor issues, not really notes per se so much as very subtle elements which add to the complexity of the overall scent. Basically, this is a scent which starts with a marvellous green chord, and finishes with an excellent oud note. The opening is green, tangy, resinous and slightly rubbery. It is full-bodied, even rich, yet dry. Fantastic! The anise/fennel note is prominent, indicative of the absinthe. The scent develops into a very well-considered oud. Works well, wears well. More woody than medicinal-challenging. A bit bright and piercing at first. Intriguing, classy. Rose clings to the oud in later stages for a classic, warm combination. I urge people to give this a try. 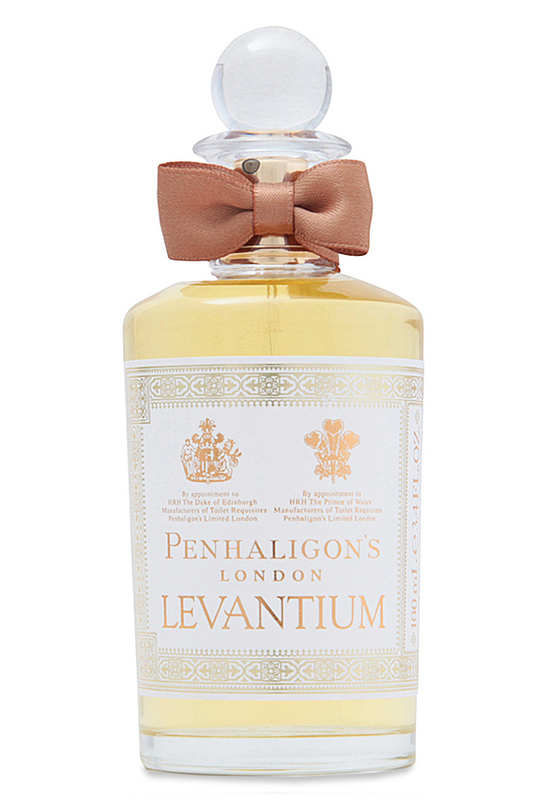 I think it is a winner, one of the best of Penhaligon's recent introductions. If you love classic orientals but can't wear them without getting a headache, this could well be one to try. It's woody and a little bitter, but the terribly restrained and British nature of Penhaligon's house style brings it firmly down into the realms of tolerability. I'll leave it to others to pick out notes but for me this is one of the few "true" oriental fragrances I enjoy. I won’t hear an unkind word said against Levantium; it wears beautifully. ‘Wear’ is the operative word as the overall feel is of something one would expect to waft from some exotic potion that will pamper and smooth the skin and gloss hair. It makes itself completely at home on my body. Those searching for an oud that is not quite so dominantly an oud will find it in Levantium, as right from the opening it is modulated with other woods, a fatty, creamy sandal, a touch of cedar, some sweet guaiac. The interplay provides a harmony which is further enhanced by the spices and balsams – I was struck by how close the clove, cardamom and myrhh notes are to the wood tones, how lovingly they combine. The other notes provide a little herbal uplift and unctuous fullness and moisture to the main ‘woods and spice’ theme – this is no dried out, bristly ruffian; it hearkens back to healing oils and hammams. Perhaps the sweet ‘amber’ in the base will not be to everyone’s liking, perhaps the oud merges a bit too quickly with everything else, perhaps the projection could have been better. Nevertheless, it’s a winner for me. There are no member images of Levantium yet. Why not be the first?